The geometry of spacetime around a black hole behaves like a quantum computer, and it can encode photons with quantum messages, according to a new paper in the journal Annals of Physics. The author suggests that this means quantum computers could be used to decode some of the mysteries of the universe. In the race to build a scalable quantum computer, devices that use beams of light—that is, streams of photons—to carry the quantum information are among the frontrunners. This is because it is easy to use photons’ degrees of freedom to encode the quantum bits, or qubits, that are the standard information units in quantum computing. The term ‘degrees of freedom’ refers to those properties of the photons that take values that can be used in an equivalent manner to the “0” and “1”, in classical computers. “In this research, we use polarisation and orbital angular momentum (OAM) of photons as the carriers of quantum bits,” says the paper’s author, Ovidiu Racorean, a researcher at the General Direction of Information Technology in Bucharest, Romania. 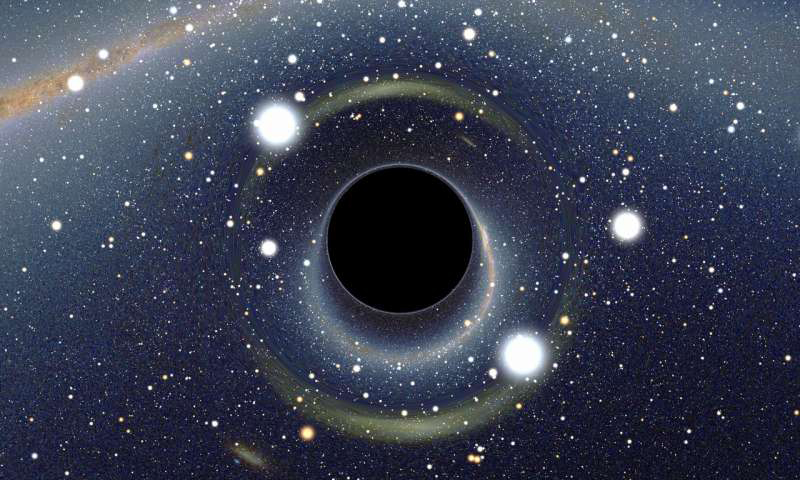 “The distorted geometry of spacetime near rotating black holes can create and manipulate quantum information encoded in beams of light that are emitted by, or that pass close to, these black holes,” explains Racorean. This is similar to the process that happens in a theoretical quantum computer. “A quantum computation process consists of photons travelling throughout a setup of mirrors, beam splitters, and prisms that switch the polarisation and twisted phase of photons to values that can be mapped onto 0 and 1,” adds Racorean. Photons that are processed in this manner can encode quantum gates and quantum circuits that are more or less similar to those in a classical computer when they exit this setup. “The novelty in my research is the suggestion that the geometry of spacetime near spinning black holes acts in an identical manner to this setup of prisms and mirrors,” says Racorean. This means that a spinning black hole writes a quantum code that we may decode in the near future when we come to create quantum computers. “We are now on the verge of a new technological era, an era that will be dominated by quantum technology,” Racorean concludes.